Popular protests in Nabi Saleh, Nilin and Bilin today have been replaced with the central march outside Ofer prison, in support of Palestinian political prisoners. Activists reported that several hundred Palestinians from villages across the West Bank (including Nabi Saleh, Bilin and Nilin) have demonstrated out of Ofer Prison in support of Palestinian political prisoners. Israeli Occupation Forces (IOF) have open fired with tear gas, rubber coated steal bullets and live ammunition. Reports of at least 5 protestors injured, including at least 2 women shot directly from two meters away. Muhamad Yassin from Bil’in has been shot twice – in the face and stomach – and is currently undergoing surgery. This past Friday approximately 500 people gathered in the West Bank village of Bil’in to commemorate the 9-year anniversary of theirweekly Friday demonstrations. Demonstrators began at the mosque and marched in a procession towards the wall surrounding the neighboring settlement of Modi’in Illit. People came from all over Palestine to participate, including many demonstrators from other villages participating in the popular struggle protests such as Nabi Saleh. It is worth noting that numbers were minimized due to the scores of people who chose to attend the public funeral of Moatazz Washaha. Demonstrators reached the wall and broke open the gate meant to deter protesters from the rest of their land and the neighboring settlement. 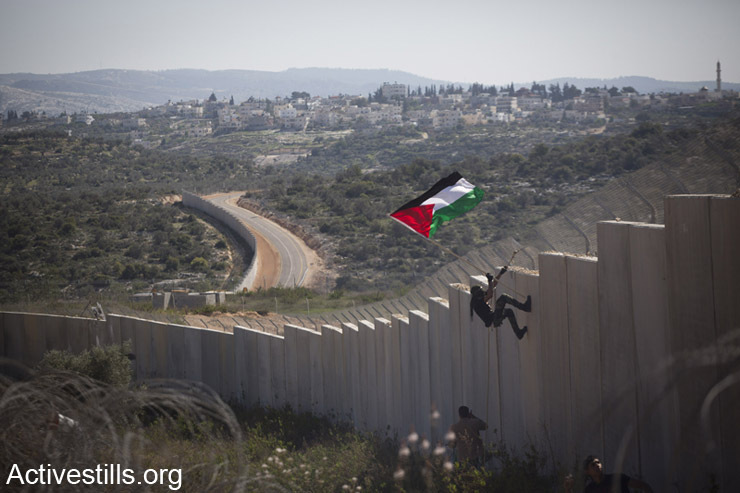 Several young Palestinian men scaled the wall to secure Palestinian flags at the top. The Israeli military responded with tear gas, rubber bullets, and stun grenades. Youths scattered throughout the hills, hurling stones over the wall towards the soldiers. Settlers from the neighboring Jewish settlement gathered in the streets to watch the events unfold. Clashes lasted for a few hours, before the army came out and arrested two demonstrators: Sameh Tayseer Sa’adar and Kufr Nimeh. Bil’in is a small village located in the West Bank about half an hour north from Ramallah. The local economy relies primarily on olive trees for income. Citizens of Bil’in began staging these weekly protests in February of 2005 after Israel set up a separation barrier (then just a fence) that cut the residents of Bil’in off from 200 acres of their agricultural land. The settlement of Modi’in Ilit, illegal under international law, now sits on a portion of the village’s land. Demonstrators adopted the method of popular resistance, choosing to partake in unarmed protests and coordinated action by demonstrating every Friday after prayer ended. The Israeli military categorized (and continues to categorize) the weekly protests in Bil’in as “violent disturbances of the peace,” according to B’Tselem. Under Military Order 101, created in 1967 when Israel began it’s occupation of the West Bank, Gaza Strip and Golan Heights, Palestinians in the occupied territories have no right to the freedom of expression or assembly. The order contravenes both Israeli and International law. 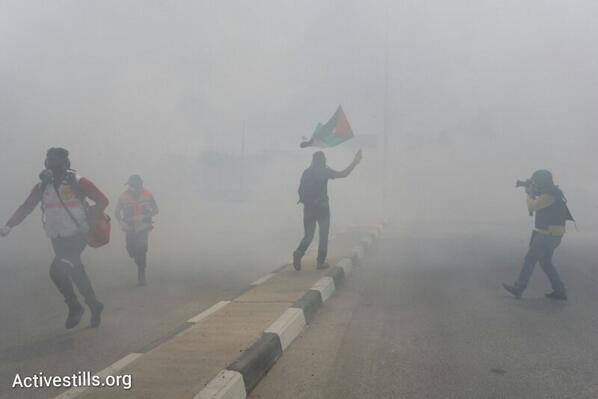 The demonstrations in Bil’in have been met with brutal repression by the Israeli military as well as the settlers. 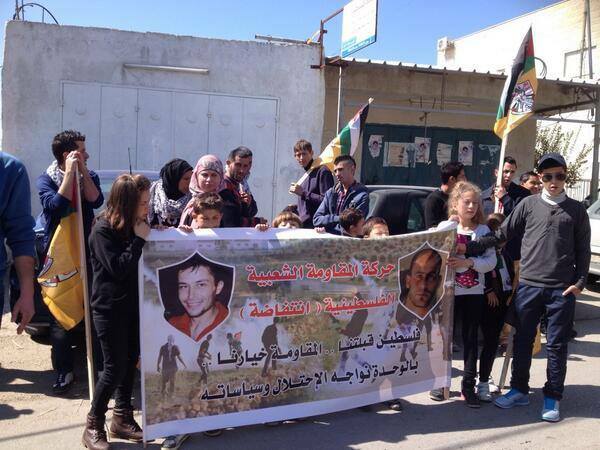 Siblings Bassem and Jawaher Abu Rahmah were killed in separate occasions during clashes with the Israeli military. Night rides are a common occurrence in the village; olive trees have been burned, homes are raided, children are taken to jail, and unarmed demonstrators are often subjected to beatings and bullets. The protester’s persistence paid off in 2007 when Israel’s High Court of Justice found the fence to be illegal and ordered it to be removed. However, it took three years for the fence to be removed and the new wall is to be rebuilt (this time made of concrete) around the edges of the Modi’in Illit settlement. During the three-year wait, the settlement had expanded and thus the new barrier still prevents Bil’in residents from accessing 1,500 dunams (about half a square mile) of their land. Protests continue in attempt to regain the remaining land. The model of demonstration used in Bil’in is becoming increasingly popular as a form of resisting the occupation, notably in villages such as Nabi Saleh, Ni’lin, Kufr Qaddoum and Al-Maasara. “For us it is so important to continue to encourage other people in other places to use this type of resistance. Through this action we will invite new people, Israeli, International, Palestinian together to give people support to continue their struggle… this is not just a vision for Bil’in, it is a vision for all of Palestine” said Popular Struggle Coordination Committee member and Bil’in leader Abdallah Abu Rahmah in an interview the Palestine Monitor. Activists in Bil’in intend to continue their weekly demonstrations until they receive the rest of their land. For many, the struggle will continue until the occupation has ended entirely. Bilin demonstration to mark the village’s 9 years of struggle against Israel’s apartheid wall and occupation. As reported previously: Palestinian activists from village across the West Bank, including Nabi Saleh, dismantle Israel road block. IOF detained Naji Tamimi, Abdalah Abu Rahmeh and Mohammad Al Khateb on their way to participate in the action. They were released after being blindfolded, handcuffed and detained for 4 hours. Palestinian activists, accompanied by international supporters, descended on an Israeli military roadblock in the Palestinian village of Al Walaja at noon Thursday, quickly dismantling it before Israeli forces could arrive on the scene. The activists used a sledge hammer to break the lock on a steel gate blocking the road between Al Walaja and the bordering village of Beit Jala. The gate had been installed by the Israeli military in the past year to prevent movement between the two Palestinian villages at the location where the Israeli separation wall will eventually be built. Activists used the leverage provided by the now-open gate to shift the massive concrete block on which it was anchored, eventually sending the entire apparatus tumbling down the steep hillside. The group then made a quick getaway, leaving the site before a single member of Israeli forces could arrive to interfere. Some participants even drove through the newly opened road, passing through Beit Jala land, including the Cremisan monastery, that will be even further divided by the separation wall if it is built as planned. Many of the activists who participated in this action were attending the Bil’in International Popular Resistance Conference, taking place this week. RAMALLAH (Ma’an) — Dozens of Palestinian protesters were hit by rubber-coated bullets while others suffered from tear gas during clashes Friday across the West Bank between Israeli troops and protesters. Hundreds of young Palestinians rallied after Friday prayers to protest the death of a young Palestinian man, Arafat Jaradat, last week only five days after he was detained and interrogated by Israeli intelligence, and to show solidarity with hunger-striking Palestinian prisoners. A Ma’an reporter in Ramallah in the central West Bank said clashes broke out in different areas in the district including nearby al-Bireh, a neighborhood in Beitunia close to Israel’s Ofer detention center, the Qalandiya checkpoint and the town of Bilin west of Ramallah. He highlighted that more than 15 young men were hit by rubber-coated bullets in addition to dozens who were hurt by tear gas which Israeli troops fired heavily near Ofer detention center. Large numbers of Israeli troops deployed heavily in the area. They showered the protesters with foul-smelling liquids. The protesters, for their part, threw stones and empty bottles at the soldiers. Similar clashes erupted near Qalandiya checkpoint between Ramallah and Jerusalem during which six young Palestinians were hit by rubber-coated gunshots, and several others were hurt by tear gas. The Ma’an reporter highlighted that high velocity tear-gas canisters the soldiers fired hit some vehicles as they traveled on the main road near Qalandia. In Bilin to the west of Ramallah, locals marched after the Friday prayer commemorating the eighth anniversary of the popular resistance movement which started in the village when Israel started to build the separation wall. 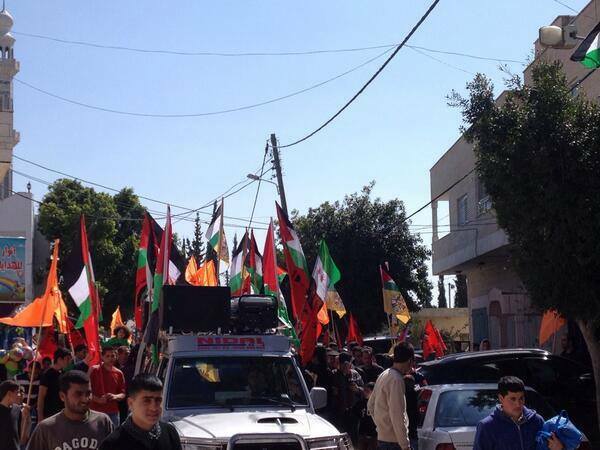 Prime Minister Salam Fayyad joined the rally in Bilin along with Palestinian officials and faction leaders. Among the participants were the governor of Nablus Layla Ghannam, secretary-general of the Palestinian Liberation Front Wasil Abu Yousif, DFLP official Ramzi Rabah, secretary-general of the Palestinian National Initiative Mustafa Barghouthi, official in the Popular Struggle Front Rizq Nammura, and others. Fayyad and the governor of Ramallah were among hundreds who choked seriously as they inhaled tear gas. Foreign solidarity activists who joined the rally were hurt as well, while four young Palestinian men were hit by high-velocity tear gas canisters. According to a Ma’an reporter, Israeli soldiers showered the participants with tear gas canisters, stun grenades, and foul-smelling liquids while others fired rubber-coated bullets. The soldiers, he said, chased the protesters in military jeeps between olive trees in the fields. As a result four young men were hit by high-velocity tear gas canisters. They were identified as 17-year-old Muatasim Mansour, 20-year-old Issam Yasin, 22-year-old cameraman Ali Abu Rahma, and 18-year-old assistant paramedic Nimir Malasa. 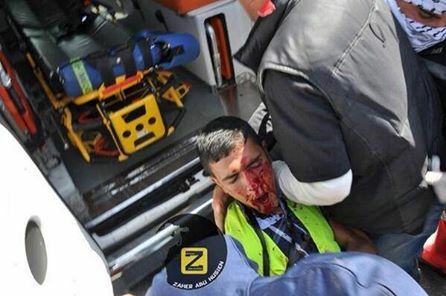 Two of the victims were hit right in the head, and were evacuated to Palestine Medical Compound in Ramallah. The other two were hit in the abdomen and one on the foot. Two ambulances were also hit by tear gas canisters smashing their windshields. Bethlehem district in the southern West Bank saw clashes after Friday prayers in several locations across the district including in Tuqu to the east where Israeli troops dispersed a rally using tear gas canisters and rubber-coated bullets. No injuries have been reported. Other skirmishes broke out in the town of al-Khader south of Bethlehem city. The clashes took place near al-Nashash gas station very close to the Israeli bypass road known as route 60. Locals told Ma’an that dozens choked as a result of inhaling tear gas. 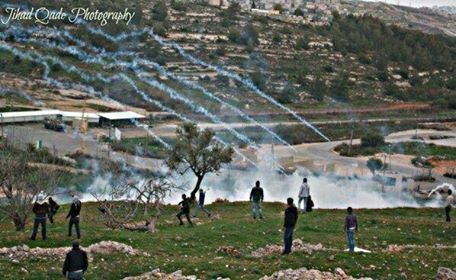 More clashes erupted in Nabi Salih village after Israeli forces forcibly dispersed the village’s weekly protest against Israel’s separation wall and settlement activities. A statement by a local popular resistance committee said Israeli forces assaulted the participants using tear gas canisters and rubber-coated bullets as they arrived at Mustafa Tamimi Street. 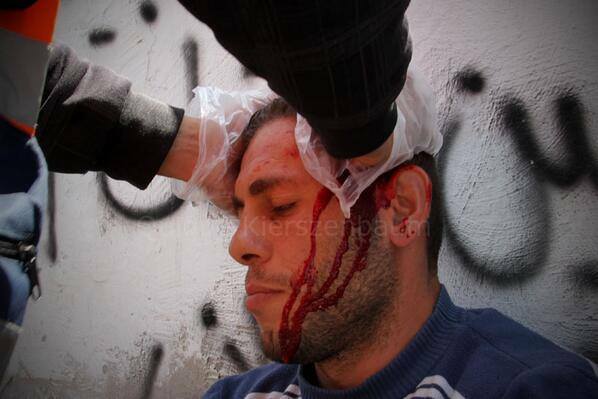 Six demonstrators were hit by rubber-coated bullets and a foreign female activist fainted during the clashes. Confrontations were also reported at the entrance to the east Jerusalem town of Anata. Witnesses said several young men were hit by high-velocity tear gas canisters and rubber-coated bullets. Fierce clashes also erupted in the central West Bank city of Salfit, namely on lands belonging to the Palestinian ministry of endowment. Locals said the ministry decided to perform Friday prayers on that land to protest damages to the land by the Israeli Ariel industrial zone. After the prayer, hundreds of worshipers rallied before Israeli soldiers stopped them using tear gas, stun grenades and rubber-coated bullets. Several demonstrators were hurt. An Israeli army spokeswoman said hundreds of people in Abu Dis, Nablus and Bilin threw rocks at Israeli forces, who responded with riot dispersal means.